The estimated time to read this page is about a minute – we guarantee it will be worth your time in your pursuit of getting that coveted fire department badge! The Firefighter Psychological Examination is a key component of the hiring process in which 40-60% of applicants are failing! Why is that? 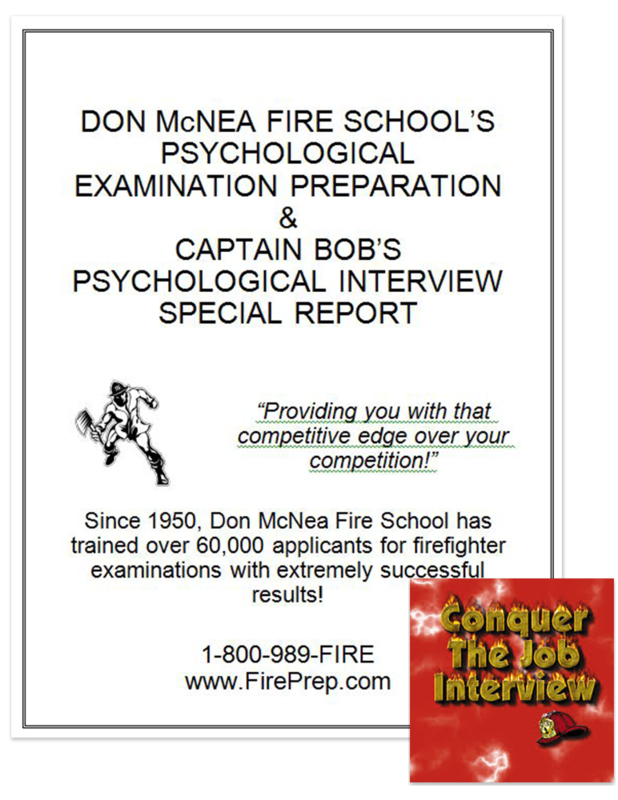 Because the number one failure on Psychological Examinations is not knowing Don McNea Fire School & Capt Bob’s Psychological Written & Oral Exam Preparation – This program gives you the inside of what the psychologists are looking for in successful fire candidates. In this 40-page workbook, we examine over 80 questions from each of the key personality traits of a firefighter. With each question, we provide you with suggested answers and explanations to put you in the mindset of what the psychologists are looking for. Candidates who are using our program are going from failure to passing and scoring over 95 percent on the psychological examination and proceeding to the next phase of the hiring process.